The Pirelli Top 10 Shootout now looms for ten of the Liqui-Moly GT3 Pro-Pro racers following the completion of Q2 this morning. Two qualifying sessions have been held so far today – one hour-long session for all drivers from 10.40am (click here for the Q1 report), followed by a further 20 minute outing for Class A cars only. In finding the top ten for the Pirelli Shootout, only the times from Q2 were considered. After setting the ten fastest times in Q2, the following entires will now line-up for the shootout at 3.40pm AEDT today. After a strong start in Q1, the Class A competitors were leaving nothing on the table in prusuit of the coveted shootout spots. Within two laps, we had our first two laps ‘in the twos’ for the event – first from the #7 Team Castrol Vodafone BMW M6 (2m 02.884s) and then from the #60 Laser Plumbing and Electrical BMW M6 (2m 02.637s). 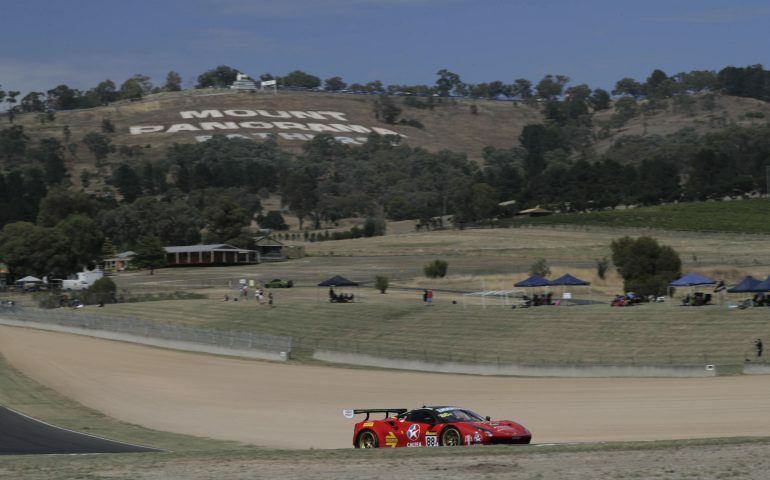 The ‘twos’ kept coming, with the #90 Castrol MARC Cars Australia BMW M6 and #12 Ice Break Coffee Virgin Australia Prosche 911 both making their way into the top runners, while the #88 Maranello Motorsport Ferrari snatched the top spot with five minutes left to run with a 2m 02.219s lap by Toni Vilander. Vilander would hold out the top until the checkered flag flew. By the end of the session, all of the top five were in the ‘twos’. There were plenty of ‘moments’ during the session too, even though it was only 20 minutes in legnth. The #7 had a major moment at the Coates Hire Essess, touring across the gravel trap at McPhillamy for a great save by Timo Glock, who then brought the car back to pit lane for assistance. There was also a heart stopping moment in the final moments of the session, with the #23 Nissan Motorsport GTR coming up fast on a hot lap on the trundling Timo Glock, with Alex Buncombe pulling out all the stops to avoid the slow car. With the #23 – the 2015 event winer – having been on a hot lap and now outside of the top ten, frustrations were understandably high. The technical regulations seeing the Class A entrants in ‘parc ferme’ mode during Q1 and Q2, any teams that conducted work on the cars (including putting the car in the garage) were excluded from participating in Q2. The #59 Tekno Autosports McLaren, #99 Walkenhorst BMW M6 and #47 Kiwi Racing Lamborghini did not make a start in this session. Overall there are a number of big names outside the top ten, however with 12 hours of racing to be held on Sunday, anything can happen.